Oscar Stars Thank Muses And, Of Course, Moms The Oscars have all been handed out, and the winners' sound bites are in. In their acceptance speeches and backstage comments, this year's crop of Academy Award winners reveled in the limelight, thanked their mothers, ducked out for drinks and let loose some profanity. 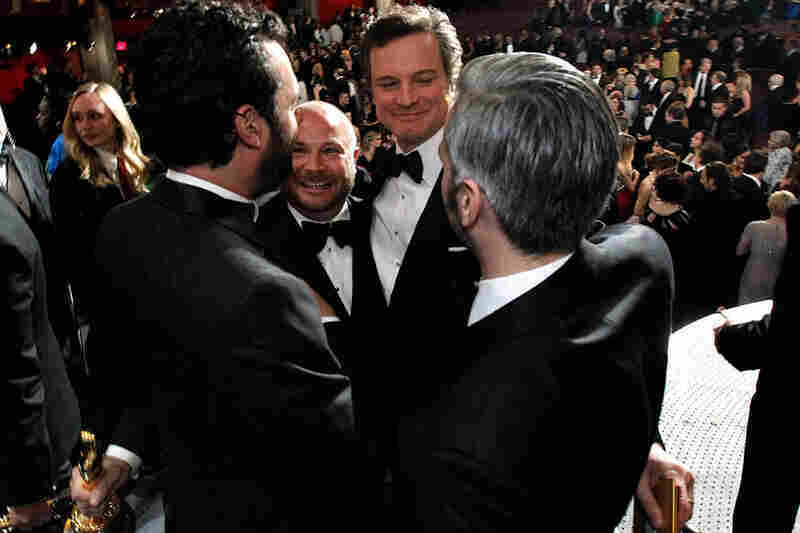 (From left) Emile Sherman, Gareth Unwin, Colin Firth and Iain Canning celebrate their Oscar for The King's Speech at the 83rd Academy Awards on Sunday night (Chris Carlson/AP). Natalie Portman accepts the Oscar for Best Actress for her performance in Black Swan. Cate Blanchett — supporting-actress winner for 2004's The Aviator — arrives at Hollywood's Kodak Theatre for the Academy Awards telecast. Hosts James Franco and Anne Hathaway address the audience at the Kodak Theatre. "You look very appealing to a younger demographic," Hathaway told Franco — a wink the Academy's choice of hosts. Melissa Leo took the Best Supporting Actress Oscar for her performance in The Fighter, presented by Hollywood legend Kirk Douglas. 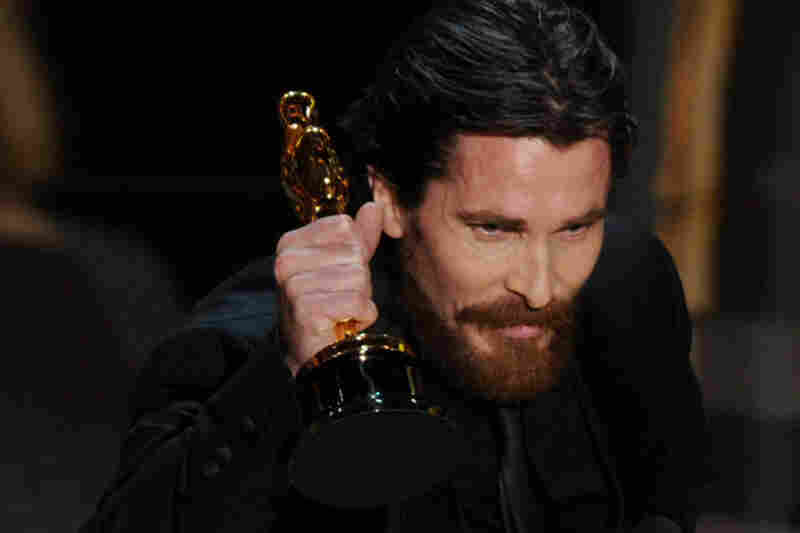 Christian Bale receives the Best Supporting Actor award, his first Oscar, for his role in The Fighter. 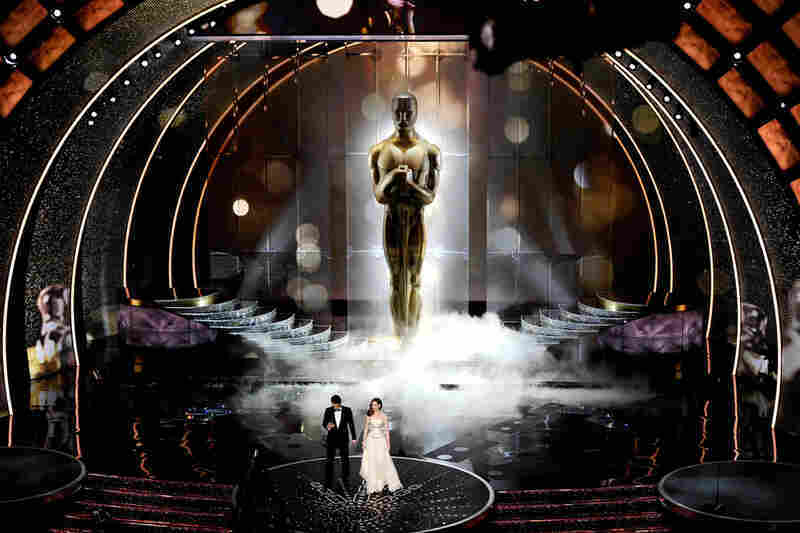 Many Oscar-watchers felt she and Franco largely fell flat as hosts — despite one gag that put Franco in Marilyn Monroe drag. 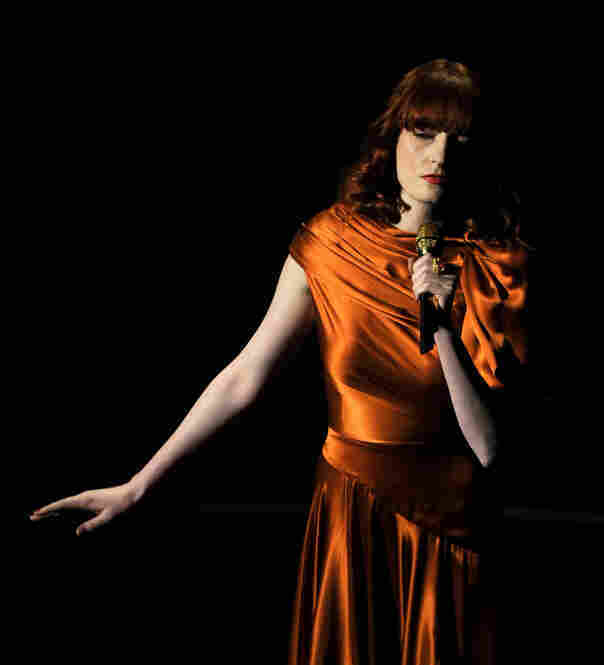 Florence Welch and Bollywood music legend A.R. Rahman performed the song "If I Rise" from 127 Hours. Jennifer Hudson, an Oscar winner for the 2006 film Dreamgirls, presented the award for Best Original Song — and won rave reviews for her wardrobe. 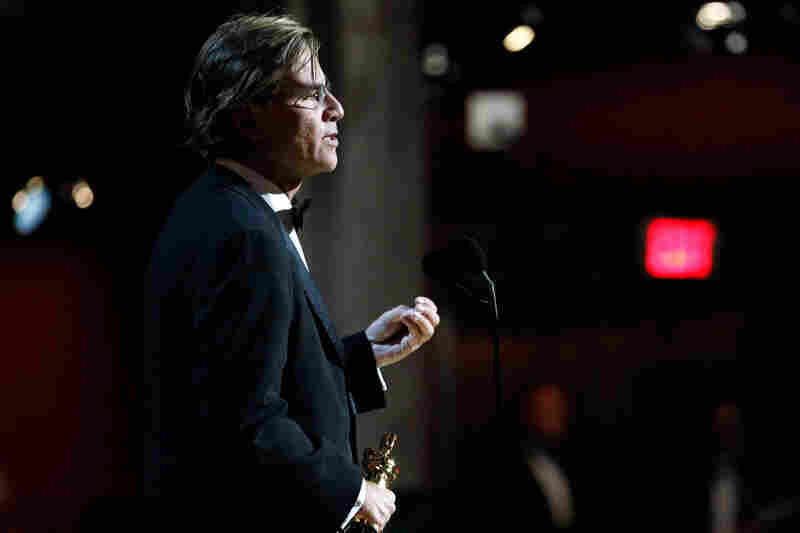 Aaron Sorkin won the Best Adapted Screenplay award for The Social Network. Colin Firth, nominated in 2010 for A Single Man, won the Best Actor award this year for his portrayal of King George VI in The King's Speech. 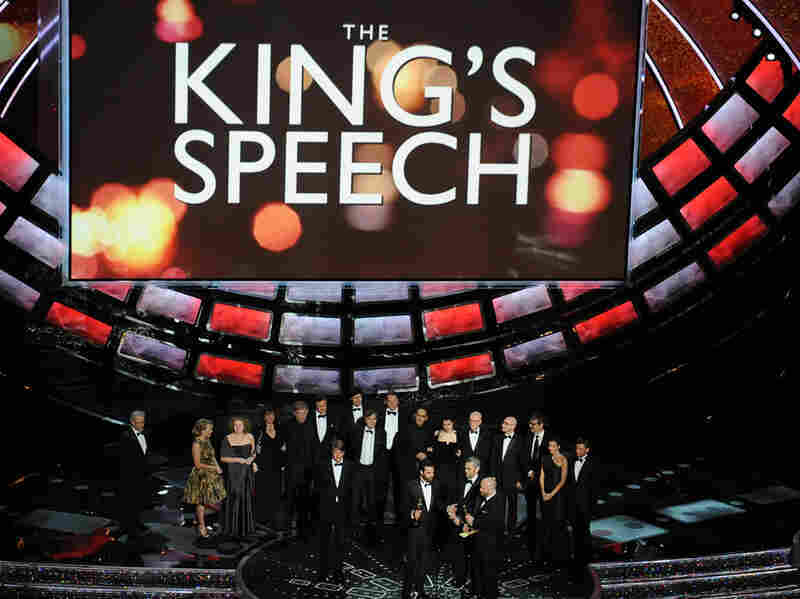 The King's Speech was the night's big winner with four Oscars, including Best Picture. 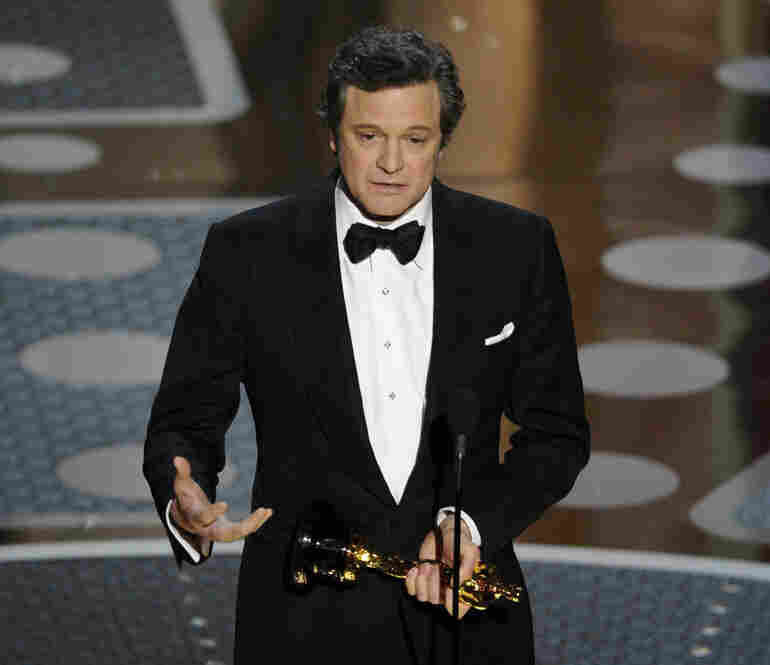 The King's Speech was crowned Best Picture and Best Original Screenplay at Sunday night's Academy Awards ceremony. It also earned Oscars for Best Director and Best Actor. It's the real-life story about King George VI, and his speech therapist, who helps him overcome a speech impediment in order to lead his people through World War II. During the telecast, writer David Seidler, who won the Original Screenplay award, referenced his own struggle with childhood speech issues. "I accept this on behalf of all the stutterers throughout the world," said Seidler, 73. "We have a voice. We have been heard." Colin Firth, who portrayed the king in the film, picked up an Oscar as Best Actor, joking, "I have a feeling my career has just peaked." Backstage, Firth said he's not happy that the R-rated movie has a new PG-13 cut. The new version mutes out the F word uttered by the Duke of York in a key scene. "In the context of this film, [the profanity] could not be more edifying, more appropriate," he said. "It's about a man trying to free himself through the use of forbidden words. And he's so coy about it. I still haven't met the person who would object to it." 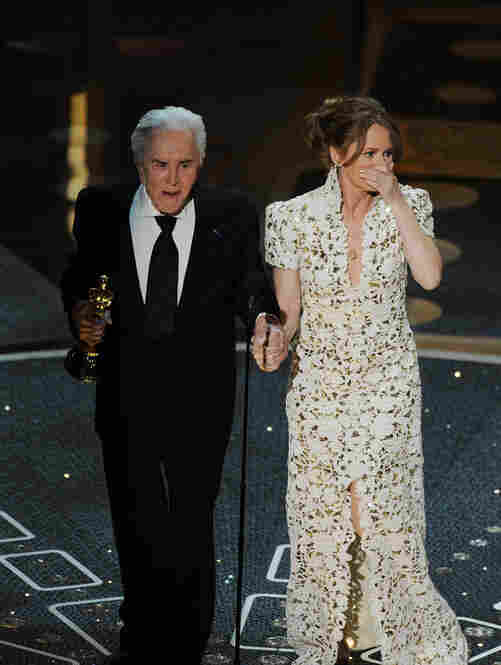 During the telecast, Academy Award censors muted out the same word during an exuberant speech by a stunned Best Supporting Actress winner, Melissa Leo. Backstage, Leo apologized for her profanity. "I had no idea," Leo said. "Those words, I apologize to anyone they offend. There's a great deal of the English language that is in my vernacular." In the film The Fighter, actor Christian Bale plays Leo's son, a twitchy, small-time boxer and crack addict. During his acceptance speech, Bale thanked the former boxer whose life he depicted, Dicky Eklund. Bale later told reporters that during the ceremony, he had gone out drinking with Eklund and missed out on Leo's Oscar moment. "They wouldn't let me in. I was literally banging on the door with Dicky, going, 'Could you let us in?' " Bale recalled. "And they wouldn't let us in, so that was just my mistake. I'll know better if I ever return to an Academy Awards. I missed the F-bomb, but I've laid down many of them myself before." 2010's Best Actress, Natalie Portman, spent a year studying ballet to depict the intense and emotionally disturbed ballerina in The Black Swan. Actress Natalie Portman and Benjamin Millepied arrive at the 83rd Annual Academy Awards held Sunday at the Kodak Theatre in Hollywood, Calif.
Portman accepted her best actress Oscar by thanking her parents, her director and Benjamin Millepied, the principal dancer with the New York City Ballet, who trained her. Portman and Millepied are expecting a child. Portman thanked her family, friends and, "my beautiful love, Benjamin Millepied, who choreographed the film and has now given me my most important role of my life." Backstage, one reporter asked Portman if she would be naming her baby Oscar. "I think that's probably definitely out of the question," she joked. The film Inception won four awards, for cinematography, sound editing and mixing and visual effects. Backstage, Paul Franklin, who supervised the effects, was asked to compare winning the Oscar to the excitement of folding Paris in half, as he did in the movie. "They're both dreamlike situations," Franklin said. "And I'm hoping that I don't actually ever wake up from this one." The Social Network, a film about the founders of Facebook, won four Academy Awards, including Best Original Score. Trent Reznor, leader of the rock band Nine Inch Nails, composed the music for the film with his collaborator, Atticus Ross. "It may encourage a number of other artists that haven't thought in terms of rigid, disciplined film scoring," said Reznor, "that there's a possibility to work in film and make something interesting and a bit different." Aaron Sorkin wrote the Oscar-winning screenplay, which he conceded took more than a few jabs at Facebook founder Mark Zuckerberg. "I think he's been an awfully good sport about all this," Sorkin said of Zuckerberg. "I don't think there's anybody here who would want a movie made about the things they did when they were 19 years old. And if that movie absolutely, positively had to be made, you would want it made only from your point of view and you wouldn't want included also the points of view of people who are suing you for hundreds of millions of dollars. But that's the movie that we made." Sorkin says he'd been cranky about the Internet but has been encouraged by social media mobilizing people in Cairo and other places. The nearly four-hour telecast had quite a few references to the Internet, Twitter and mobile apps. It even included an Auto-Tune music video mashup, all designed to attract a younger TV audience. And there were youthful co-hosts to match: the eager Anne Hathaway and the nonchalant James Franco. "Anne, I must say, you look so beautiful and so hip," Franco told her onstage — to which Hathaway retorted, "Thank you, James. You look very appealing to a younger demographic as well." Franco and his mother Tweeted about the Oscars, while his grandmother waved to actor and rapper Mark Wahlberg from the audience. Hathaway's mother jokingly admonished her to stand up straight. But it might have been Tom Hooper's mother who had the biggest impact at the ceremony. In accepting the award for Best Director, Hooper said his mother had first seen a play reading for the King's Speech at a fringe theater in London. "Thank God she did, because she came home, rang me up and said, 'Tom, I think I've found your next film,' " Hooper said, adding that she had to remind him repeatedly for four months to read the script before he finally did. "The moral of the story," Hooper said, "is listen to your mother."